MANCHESTER, England (CNS) — Bishops across the European Union are calling on member states to be generous toward tens of thousands of migrants flooding across the Mediterranean. French, German and Italian bishops have issued formal statements in response to a crisis that has seen more than 100,000 migrants, many of them refugees from wars in Syria and Eritrea, cross into Italy, Greece and Malta from North Africa and Turkey. With an estimated 450,000 to 500,000 migrants gathering in Libya, the EU has decided that the crisis constitutes the first ever “emergency situation” that allows provisional measures under the 2007 Lisbon Treaty. Because the vast majority of migrants are landing in Italy and Greece, the European Commission is seeking, under the treaty, to relocate the migrants to other nations based on factors such as population, gross domestic product and unemployment as well as the number of refugees already taken in. European ministers met June 16 to discuss mandatory quotas for the resettlement of 40,000 migrants across the EU and to consider how to break up human trafficking gangs. But proposals have met with opposition from a significant number of member states and through June 23 no agreement has been reached. The French interior minister has complained that many of the migrants are “illegal” while Spain has objected to accepting migrants when it its unemployment rate stands at 23 percent. The Polish prime minister has voiced opposition to mandatory quotas in principle. The United Kingdom and Denmark, two of three countries with a right to opt-in to asylum policies, have each refused to accept any of the migrants at all. 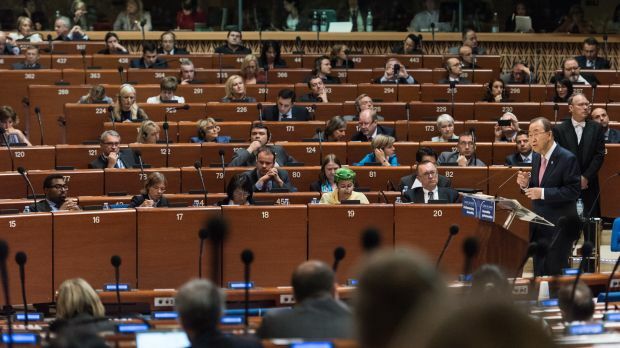 COMECE, the Commission of the Bishops’ Conferences of the European Community, supported the European Commission’s proposals for mandatory quotas across member states as soon as they were announced May 13. Father Patrick Daly, COMECE general secretary, told Catholic News Service that the quotas were an attempt by the commission to resolve the problem at a European level and was therefore an expression of the Catholic principle of solidarity. “For the Catholic Church, the fundamental principle underlying the migration issue is one of deep and profound compassion for those on the front edge: the migrants themselves who are seeking asylum in our shores, those who have placed their hopes on a better life in Europe, and there is also sensitivity for those countries on the front line, particularly Italy and Greece,” Father Daly said. “What the church is very much in favor of is an optimum both for the receiving countries and those in need of relocation in the EU,” he added. The permanent council of the French bishops’ conference issued a declaration June 17 to urge the Catholics of their country to show more hospitality to migrants. “The dignity of human beings is at stake,” said the statement signed by Archbishop Georges Pontier of Marseille, conference president, Cardinal Andre Vingt-Trois of Paris and eight others. Catholics in France should change their attitudes to migrants and “overcome their prejudices and fears,” the bishops said. “For many reasons, often very dramatic — wars, poverty, climate disruption — many are forced to leave their country where they cannot live,” they said. The churches also called on Germans to do more to assist those refugees remaining in camps across the Middle East. On June 16, Cardinal Angelo Bagnasco of Genoa, Italy, president of the Italian bishops’ conference, along with eight bishops of Liguria province along the French border issued a statement in response to the growing number of migrants attempting to cross into France, where they had been refused entry. The Vatican made its own intervention on the eve of the meeting of EU ministers. Archbishop Silvano Tomasi, who heads the Holy See’s Permanent Observer Mission to the U.N. in Geneva, told the world body in Geneva the international community was ineffectively managing migration. Such populist pressures are evident in the U.K., where migration has become such a potent political issue that Prime Minister David Cameron, a conservative, won the May general election only after he promised a referendum on whether Britain should exit the EU in order to control its borders. Royal Navy vessels are involved in search and rescue operations in the Mediterranean with one British ship plucking 1,200 migrants from flimsy boats off Libya in a single day. However, the British government is sensitive to the rise of anti-immigration sentiments among the electorate in reaction to the relocation of some 300,000 internal EU migrants to the U.K. each year. It has therefore refused to accept any migrants crossing the Mediterranean, pledging to tackle the problem “at source” instead, a policy which was described as “horrible” by Auxiliary Bishop William Kenney of Birmingham, former chairman of Caritas Europe who about a decade ago personally helped in the recovery of the bodies of a number of drowned migrants from beaches in Spain. “We have an obligation to look after these people … the reason being that they are men and women made in the image of almighty God,” he said. The plan for quotas, which is also opposed by Slovakia, Hungary and the Czech Republic, will be discussed at a summit of the 28-member EU June 25-26.